The holiday season is over, and many of us have decided never to gorge on unhealthy crackers and biscuits again. Well, it doesn’t have to be that way! 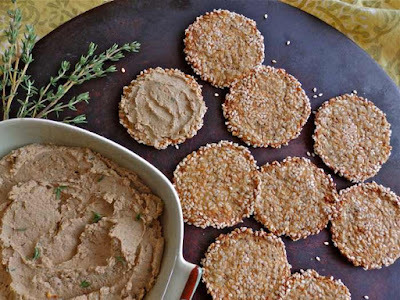 If you make your own crackers at home they can be an incredibly healthy, nutritious snack. These healthy cauliflower rounds incorporate sesame, chia and flax, in addition to a cauliflower base. Gluten-free, wheat-free and packed full of nutritional goodness, they are the perfect way to snack with your friends and family. Personally, I love eating them with some chicken liver pâté. Enjoy! Place cauliflower in a food processor and pulse until it resembles kernels of rice. Add golden flaxseed meal, chia seeds, sesame seeds, salt, melted coconut oil and water. Process until a dough is created (it should form a ball in the food processor). Chill dough until firm, 3 to 4 hours. Preheat oven to 300 degrees F (149 degrees C). Line a baking sheet with parchment paper. Roll rounded teaspoonfuls of dough into balls, then roll balls in sesame seeds. Place balls 3 inches apart on prepared baking sheet. Place a 4 inch square piece of parchment paper on top of a ball of dough, then flatten ball with a spatula, resulting in a 2 to 3 inch round. Repeat with remaining balls of dough on baking tray. Bake rounds for 30 minutes, flip with spatula and bake for another 30 minutes or until rounds are dry in center. Repeat process with remaining dough. Cool rounds completely before serving.